This is the Lookingglass Volunteer Fire Department (LVFD). The LVFD meets the needs of our community by providing well-trained firefighters for response to fire, rescue, medical and public service incidents. We protect lives, property, and the environment with compassion and a dedication to excellence. We meet or exceed the requirements of local, state and national statutes and standards related to the Fire Service. Our conduct will reflect our commitment to safety, honesty, personal responsibility, fairness, respectfulness and integrity. We recognize that the most effective way to protect lives and property is to prevent fires from occurring through fire prevention and education. Lookingglass Rural Fire District is manned entirely by well-trained, dedicated volunteers and we can always use more. Volunteers must be 18 or older and live within the district. Volunteers attend drill one night per week (currently Thursdays at 7pm). Firefighter certification requires completing an 81 hour class on structural fire suppression. Interested volunteers can take additional training to get certification for various levels of medical responder. April 4 – Human Factors Wildland: S-180: (units 1 & 2). April 11 – Human Factors Wildland: S-180: (units 3 & 4). April 18 – Human Factors Wildland: S-180: (units 5). April 25 – TPE skills review-practice-evolutions DCFD#2. May 2 – RT 130 Wildland Fireline Safety DFPA. May 9 – FFI#5 Fire Control: Ground Cover Fires. May 16 – Progressive Hose lays 1081, Handline Construction. May 18 – Extra Saturday: Support North Douglas LPG Live Fire. May 23 – EMS: FFI#22, S-VI, Bleeding control. May 30 – FFI#19: Fire Origin & Cause Determination. Apparatus Checks, & Officers Meeting. June 13 – Wildland Firefighter: S-130. June 20 – Wildland Firefighter: S-130. June 27 – Wildland Firefighter: S-130. We currently have 19 active volunteers, of which 6 are officers, 7 are firefighters and/or medical first responders, and 6 are firefighter trainees. To learn more, or to add your name to our list of volunteers, please call the fire station. Lookingglass Fire department has started a firefighter explorer academy. Teens ages 14-18 are encouraged to participate. Currently, we have 4 explorers. 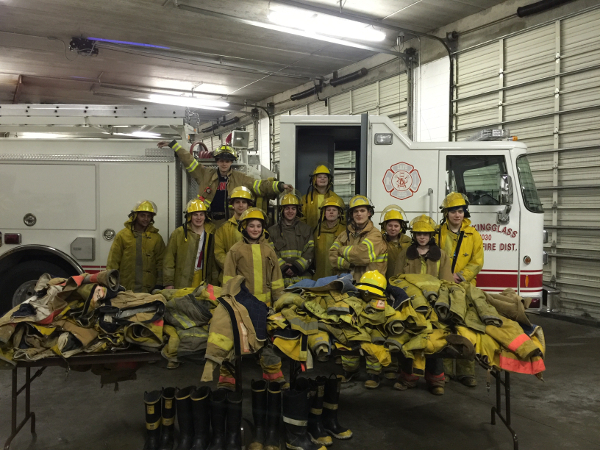 The Explorer Scouts received a donation of used equipment from a few local fire departments. Click on any of the buttons, below, to open a slideshow. Ready for search and rescue training at the windmill inn in Roseburg. 2015: Preparing for roof removal to create clearance for pt removal. 2014: Mardi with Skylar; youngest recruit?